To give vertical overlays pattern, texture and dimension, installers generally rely on three basic techniques: stamping, texturing skins and hand carving. Some artisans will use a combination of these methods to give their work greater realism and to create custom effects. For example, Nathan Giffin of VerticalArtisans.com starts out by using texturing skins and stamps for his rock-patterned walls and then hand carves the overlay to give the rocks shape and definition. "The process is fairly simple, but it's tasteful, and looks realistic," he says. Stamping is the method of choice for many contractors because it's faster than hand carving and will produce more consistent results. However, when used alone, it won't permit the same degree of customization possible with hand carving. To achieve the best results, wall overlay contractors typically use stamping tools designed specifically for vertical applications. These stamps are usually made from lightweight polyurethane or rubber and are often smaller and more pliable than stamps used for horizontal concrete slabs. Typically each stamp is designed to produce just one or two pattern units, allowing for randomized placement and easier stamping in tight spots and corners. Texturing skins are simply much thinner versions of stamps. 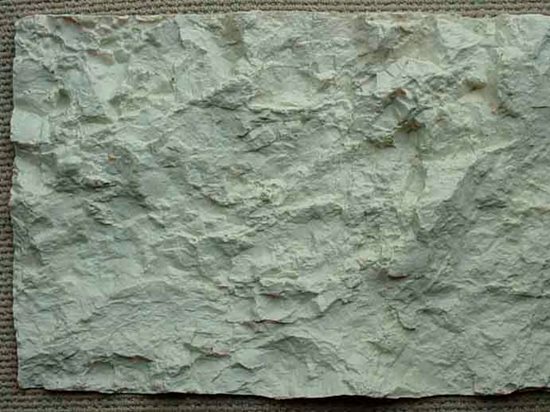 They are used to impart texture (such as the roughness of a natural rock face) to the wall surface rather than the deeper, well-defined patterns made by stamps. They can be used alone or to pretexture the wall surface before stamping or carving. In addition to the more commonplace brick and stone patterns, vertical stamps and skins with unique designs and textures are available. You'll find textures like bamboo, brick, country cobblestone, cut coral, log cabin, grape vines, weathered wood, sea life, wildlife tracks, split-face granite, and The Great Wall of China, a stamp set molded directly from the actual centuries-old wall. 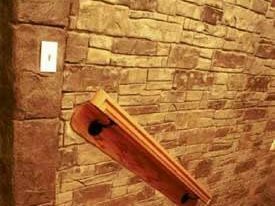 When contractors want to produce stone, brick or other wall patterns with deeper reveals and grout lines than possible with stamps alone, they often rely on hand tooling, or carving. Carving can also be used after stamping to correct any imperfections or to add custom detailing. While carving is an excellent method for detail work, it can be considerably more time consuming than using stamps or skins. "It probably takes about 30% more time than traditional vertical stamping," says Giffin. For his carved creations, Giffin uses a variety of tools including point trowels and pool trowels. Contractors can also use carving tools similar to those used for sculpting clay. Some vertical overlay suppliers also sell special tools to achieve unique effects. 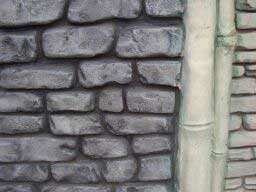 FossilCrete, for example, sells double-ended carving tools for carving out smaller grout lines or other detail work and a large carving tool for creating wider grout lines, such as you might find with random, stacked stone.